Interpersonal trust - a willingness to accept vulnerability or risk based on expectations regarding another person’s behavior – is a vitally important concept for human behavior, affecting our interactions both with adversaries and competitors as well as with allies and friends. Indeed, interpersonal trust could be said to be responsible in part for nudging competitors towards becoming allies, or – if betrayed – leading friends to become adversaries. This document summarizes the state of the art (and science) in interpersonal trust research, describing how researchers define trust and its components, exploring a range of theories about how people decide whether to trust, and describing how trust may work differently for some people than for others. This primer will not critique all existing studies and their methods. 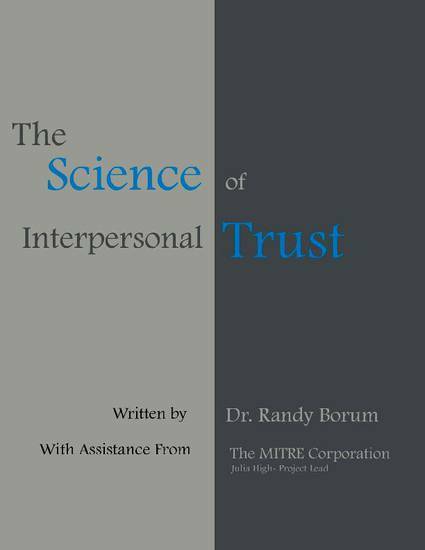 It is written as a relatively non-technical overview for individuals whose personal success depends on the development of trust and for researchers seeking to better understand how trust has been studied and operationalized, to date.